What Is the Difference Between Possum & Rabbit Footprints? Opossums and rabbits inhabit some of the same areas, usually foraging for some similar food. Opossums often eat meat in the form of carrion or earthworms, but they also enjoy tasty vegetables from your garden. Rabbits are herbivores who often sneak into gardens for food. When you spy animal tracks in your yard, look for the differences to determine who's invading your space. When you glance at small animal footprints in your yard, a fast look at the overall shape of the footprints can give you a clue whether it was likely a rabbit or an opossum. Rabbits have longer back feet than front feet, with no spread-out toes, while opossums have front feet that look almost like hand prints with more condensed back feet. Counting the toes can help you determine what animal is eating your vegetables. Opossums have five toes on their front and back feet. The front feet have splayed-out toes, but the back feet have four toes that group together and a big toe that sticks out to the side almost at a 90-degree angle -- it resembles a thumb sticking out from a human hand. Rabbits have five toes on their front feet, but you only see the imprint of four. One is a dew claw located higher up on the foot, so it doesn't touch the ground. Unlike the long toes of opossums, rabbits have short toes, so you see only a small imprint at the top of each footprint. Rabbits have two different shapes for their feet. 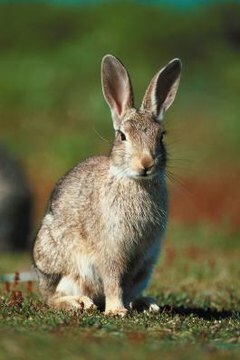 Their front feet tend to be circular, and their back feet make longer oval footprints, depending on the rabbit species; some have back feet that are only slightly more oval than the front feet. The size of rabbits' feet varies, but the difference in the front and back can be as big as 1 inch long for the front feet and 3 inches long for the back feet. Opossums have front feet with five fingers that form a semicircle around a central palm. Their back feet look more like an oval with one extended side toe making an "L" shape. There's usually not as big a discrepancy in the size of opossums' front and back feet; many have front feet 1 1/2 inches long and back feet about 2 inches long, for example. Rabbits and opossums aren't the only critters that could be visiting your yard to snag food, and some have similar footprints. Raccoons and muskrats also have footprints that look like handprints, and you might mistake them for opossum prints. Squirrels run with a bounding gait that can mistaken for rabbit tracks, although they show five toes on the back. The back feet of badgers and skunks are slightly elongated with rounder front paws, also making them easy to confuse with rabbit feet.